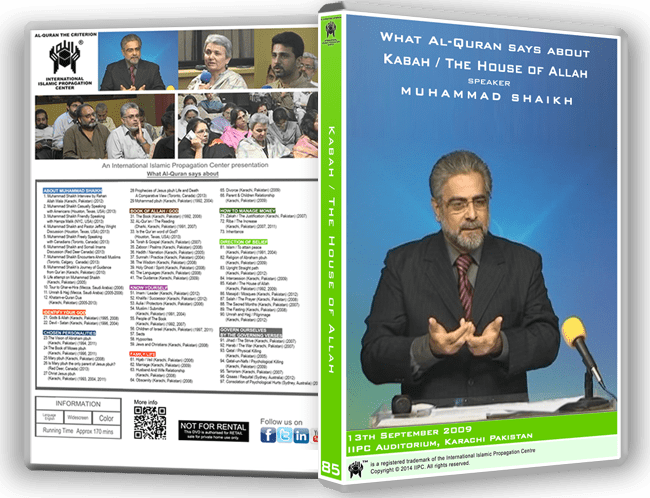 Lecture that establishes from the verses of the Quran the status of God’s house (the Kabah) from day one and the qiblah which is not only the direction which Muslims face when praying but also the direction of belief, which every one in the world has but which gets reestablished when they turn towards Allah. It is the reestablishment of peoples beliefs toward the one and true qiblah (which has remained unchanged in all times) that occurs all through time from the past and will continue into the future. Additionally the location of Masjid Al Aqsa is also described in this lecture through the verses of the Quran with all its implications. How Allah changes the Qibla (direction of belief) of mankind & guides them to straight path? Is not Al Qaeda s to be followed by the Muslims in the House of Islam? To whom the Book is given, don’t they recognize Qibla of the messenger, like they know their sons?